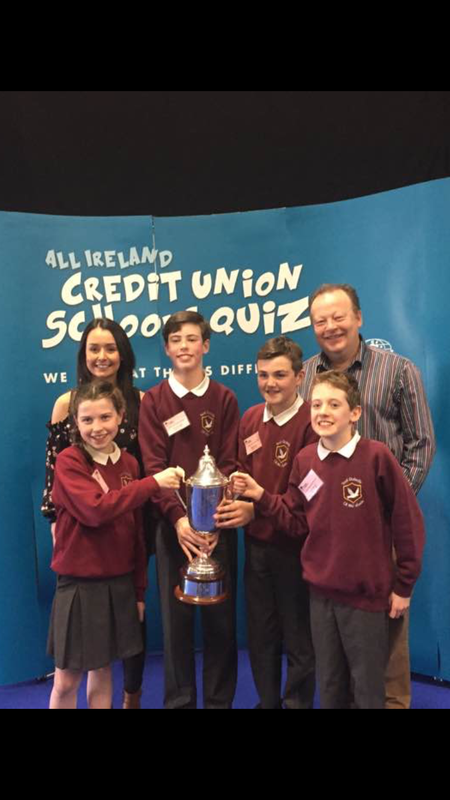 There was great excitement in the school as our School Quiz team recently won the All Ireland u-13 Credit Union Quiz title after a pulsating and epic contest in the RDS in Dublin on Sunday, 2nd April 2017. Over 5,500 teams initially entered this 32 county quiz, with over 20,000 children competing in the event. 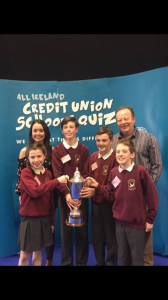 Kilmacrennan School qualified to represent Letterkenny Credit Union in the National Finals and this event was hosted by Aiden Power. The questions were challenging. However our team rose to the challenge and were well positioned after the initial five rounds, scoring an impressive twenty-nine points out of a possible total of thirty. Yet this left them in second place, with one team having made a barnstorming start of thirty out of thirty. There was a rapturous welcome home in the School Hall for the winning team that night. Print article This entry was posted by Admin on April 7, 2017 at 10:58 am, and is filed under General. Follow any responses to this post through RSS 2.0. Both comments and pings are currently closed.